But he'll answer your tech-related questions, including: do I need a standing desk, how can eradicate camera shake and how can I tech-up my bathroom? 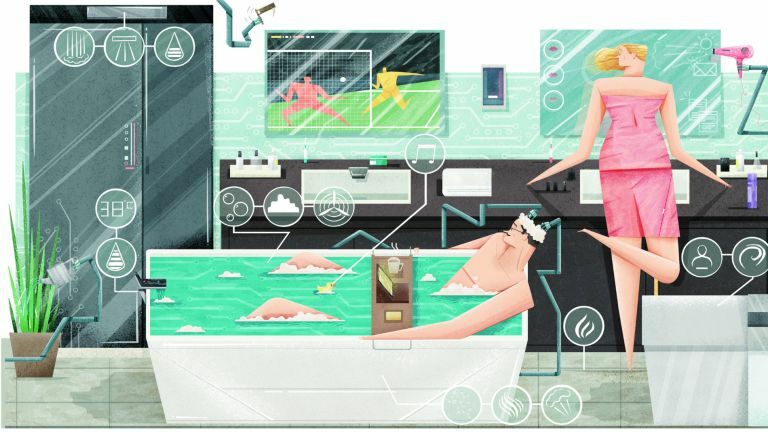 How can I tech-up my bathroom? Ah, the bathroom. GaGu's one true sanctuary. Mrs Guru and the kids aren't too happy about having to ablute in the rear courtyard under the hose, but a man needs his privacy. If you're going for a full remodel, build everything around Kohler's luxurious Numi toilet ($6,400/£4,523), an angular ceramic box that hides an integrated selfcleaning bidet wand (which will also air-dry your unmentionables afterwards), has an auto-opening heated seat, a foot-warmer and inexplicable lights, and even plays back your favourite tunes via Bluetooth. With that out of the way, it's time for a shower. While the Phoenix Shower Blade 2 (£186) can't be pulled off the wall to give your undercarriage a squirt, its oblong mixture of raindrops and waterfall action make it a pleasant way to wash away the evidence of the night before. Ignore all shower heads with lights, speakers or heating coils built in: shoddy electrics and water are a recipe for disaster. Instead, put the Hansgrohe RainBrain (£4,590) in charge of the shower itself – it'll preheat the water to your exact specs, play music, regulate flow rates, prevent scalding and, if you share a bathroom, store five user settings on board. If you're one to fester in your own filth, a combination whirlpool (side jets) and airpool (bottom bubbles) bath should be on your list; most of these systems can be installed in any tub, but keep £1,500 aside for the privilege of having your dirt particles sloshed around you. Grab an automated mixer tap for your hand basin (heck, why not plump for a £1,379 Dyson Airblade Tap while we're in the squandering-money mood), and make sure there's at least one screen to distract you from the important business – the Watervue 42-inch Bathroom Mirror TV (£2,005) is mist-free, waterproof, and shows you just how hideous you are when it's switched off. Stay safe, be seen? Rubbish. How can I hide? As you know, Guru doesn't ask any questions, he simply judges you on your reasons for such shady behaviour and moves on. In this case, we'll just presume you're some sort of urban ninja. But, believe it or not, invisibility is beyond GaGu's many powers, so we'll just have to get as close as we can. First, let's get dressed. Forgo the ridiculous digital 'universal camouflage' pattern of the US Army – it blends into precisely nothing – and plump instead for garments made of MultiCam fabric. This not only blends in well with most environments, it also dampens reflections in the infrared spectrum, meaning you'll be near-invisible through a night-vision camera, too. Expect to pay around £80 for a quality shirt, and a similar amount for some tactical trousers. Oo-er. The Härkila Lynx GTX 6 hunting boots (£150) are light, flexible and designed for minimal noise, plus the Gore-Tex liner should provide a bit of comfort and breathability. While we're getting specific, you should spray your most odorous regions with a scent-neutraliser like GHOST ($6.45/£4.60), which has apparently been tested using actual bloodhounds. Providing you've found a bush to crouch in, you should now be virtually invisible to all but the most determined stalker. But one look in your pockets and you're going to be found out – what you need is a new identity. GaGu doesn't recommend any sort of false documentation, of course, but why not purport to be from a different nation? Invest enough money in a country with a 'citizenship by investment' program (like St Kitts & Nevis or Grenada), and you'll get a passport in return. Alternatively, you could sport a World Passport issued by the World Government of World Citizens (from $45/£31). They're basically a political statement and not accepted at any border, but if you're required to hand over your passport to a group of vigilantes, you might just get away with it. Or you might get beaten up. Worth a try, though, right? Hi Mr Guru, can you help me measure something? Guru is well aware that sometimes things are so large, traditional measuring devices don't make the cut. You could look at a tradesman's tool like the Leica DISTO 2 (£70) if you're calculating room dimensions, but laser measurers have limited applications in other fields. Digital measuring tape seems like it should be a thing, but beyond the Pocket Smart String (£8.50, if you can find it) and a host of eBay tape measures with pointless LCD displays on them (don't bother), there's not much out there. You could go upmarket with Ettinger's leather-clad Lifestyle Black Square Tape Measure (£70, ettinger.co.uk) – but why would you? If the thing you're measuring is disappointingly small, of course, you'll want to get maximum precision with a set of digital calipers. Don't skimp – the cheap Chinese ones are inaccurate and flimsy – so pick something like the US-made Starrett 799A-6/150 (£100), which has a supremely miniscule resolution of 0.01mm. Man vs Tech: What happens when you spend an entire day in VR? First vinyl, then cassette, now VHS? OK, enough of this nonsense. GaGu is now putting a stop to it with his beard-clippers of hipster justice. There's one reason and one reason alone to care about VHS: skiploads of discarded, awful tapes. Some of these contain content you can't find on other formats, and that can only be because it's completely unworthy of restoration or preservation. The unending retro-cycle has hit the Nineties, so of course there are Global Technacolour-clad Zack Morris fans flapping around with brick phones, waving copies of 'ironic' bad movies in Blockbuster Video rental cases in your face, accusing you of being a plaid-clad curmudgeon. But tell them this from Guru: VHS is rubbish, and so are they. Do I need to invest in a standing desk, Gadget Guru? Guru has seen the studies. “Sitting is the new smoking,” say people ignorant of the current trend of boiling nicotine atop dangerous batteries. So perhaps standing desks are a good idea. Whether you pick up an add-on to your current desk, like the Ergotron WorkFit-S (£468) or a convertible sit/stand hydraulic affair (IKEA does the BEKANT from £445) is entirely up to you. Perhaps the latter would be the best choice, at least to start with: GaGu suspects that if you're a big fan of sitting down, your gelatinous spine might need whipping into shape a bit first. Help me with my shaky vids! Guru is sure you've tried the software way of correcting such things. There are few quicker ways to make someone turn a shade of green than to show them an artificially stabilised video. His solution for you – beyond laying off the caffeine – is a hardware rig. If you're going in at ground level, the Steadicam Curve gimbal (£20) is a wildly affordable way to keep GoPro Hero videos from looking like they were filmed inside a washing machine full of rocks. The next step up, the hideously named Smoothee (£140) offers rebalancing options for heavier devices, a universal phone mount and a friction-free gimbal socket.